To sing, oh, oh, oh, oh! In the blueness, painted in blue. Happy, to be up there. 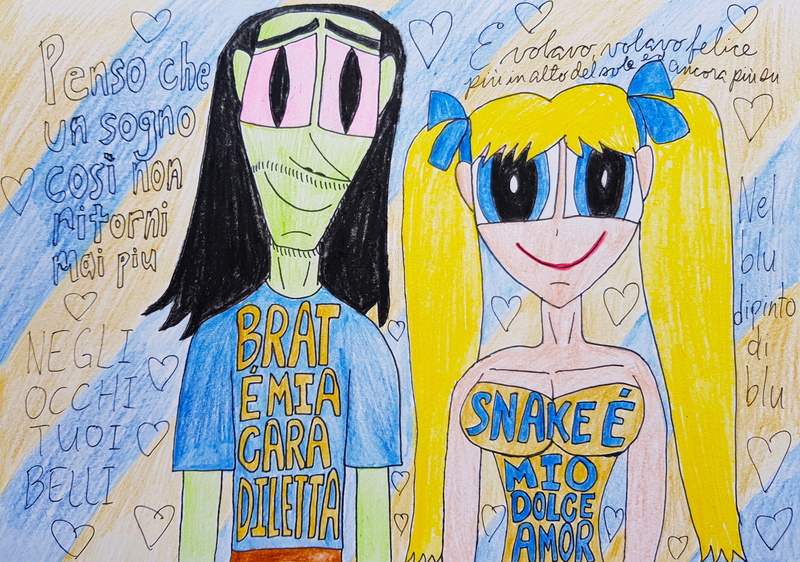 This piece of SnakBrat fanart, which is part of KatyGorl’s Claim a PPG Pairing Month back in September, is dedicated to Blueelephant7 and Larisa aka glittermuffins who celebrated their birthdays a couple of days ago. So, I hope you guys had an amazing, awesome, thrilling, and splendid birthday. I wish you a lot of love, joy, and prosperity in everything you do as artists and as people. Ah, Snake x Brat or SnakBrat. This is a pairing I came up with seeing that I am not really a fan of pairing Sanford D. “Snake” Ingleberry up with Bubbles and prefer for him to end up with Brat of The Powerpunk Girls, but that is just my personal tastes. I just think these two are really adorable together and I can see it being the classic love-hate relationship which will eventually mellow out when these two drop their defenses and start being cuddly and comfortable with each other. My love song for these two, which is, in turn, one of my favorite Italian pop songs, “Volare” composed and originally sung by Domenico Modugno is certainly a nice tune for these lovebirds. I grew up with this song when I was an eleven-year-old boy and I first heard Russell Watson singing this and I enjoyed his rendition. So, I hope you also enjoy listening to Mr. Watson’s rendition of this song. I hope you all enjoyed taking a gander at this piece of SnakBrat picture and I will see you in the next submission. Sanford D. “Snake” Ingleberry and Brat Plutonium from The Powerpuff Girls belong to Craig McCracken and Cartoon Network.